Ignacio Calderin: "I wasn’t a criminal. I was young and dumb"
After his release from prison in 2002 he struggled at first to reintegrate. But then he found his passion; helping others deal with life after prison. His phone is full of what he calls the "success stories" from doing his job. Now he wants his voting rights back. A promising American football college scholarship in Ohio ended when Ignacio Calderín suffered an injury and returned to Miami. "Idle time is the devil’s playground. I started hanging with the wrong people," says Calderín, now 48 and wiser. Of his abbreviated college career he says, "I majored in psychology with a PhD in streetology." To feed a drug addiction he turned to armed robbery, later accepting a plea after he voluntarily turning himself in. Despite no acts of violence of injuring anyone he was sentenced 20 years, ending up serving 11 years and 3 months. "I was a young kid with no direction. I wasn’t a criminal. I was young and dumb," he says. In prison Calderín learned from the experience of older inmates, who encouraged him to have hope of a future after he got out. "There’s a lot of good behind the fences. "It’s a school and you learn every day," he said. The son of Cuban immigrants older Cuban inmates looked after him. He was released in 2002 and struggled at first. But he found his passion in helping others struggling with life after prision. Now he visits prisons as part of his work as a supervisor with Transition a Miami non-profit which provides job training and job placement services to ex-offenders to help their re-entry back to society and reduce the rate of recidivism. "I would work there for free," he says flicking through photos and texts on his phone from people he has helped. "That’s what we do: success stories," he said. "I have been on the right track thanks to Iggy (Ignacio)," said Cedric Austin, 35, who was released in May after serving 17 years for armed robbery. "He would come once a month when I was still incarcerated and we worked on goals. He asked me to write them out. It made it more tangible." Most important of all Calderín helped Austin get a job with a company building prefab panels. "I got a raise after 60 days from $12 an hour to $14. I can get $2 more in November," he said, adding "I got a truck and I started school." 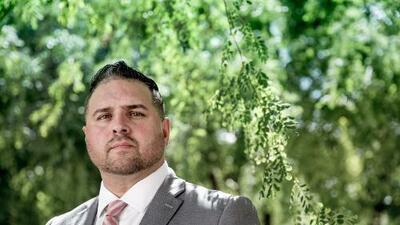 A supporter of Amendment Four Austin says he looks forward "to having a voice again. It means the world for me to be able to punch a ballot. I have learned what it means to have your civil rights - and not to violate the rights of others." Stocky and muscle-bound, he gave up a previous job doing security at a night club. "I just wanted to give back and do the right thing," he added, describing how he began volunteering at Transition mopping floors. He is critical of the prison system for not doing enough to prepare inmates for life after they are released. "The Deparment of Corrections is just a human warehouse," he said. "They tell you when to eat, when to sleep and when to wake up. When you get out you don’t know how to function. We can help them and guide them. And we are a bridge to the future." He sees his job as part job finder and part motivator. "I see my clients come in all down and depressed and I tell them ‘believe in yourself,'" he said. "We empower them. I speak at their graduations. I got to high schools to help them understand they can become a regular human being and that there is more to life than doing drugs." Calderín has a 29 year old son born while he was in prison. He married after he got out and now has a five year old with his wife. They just became proud homeowners.